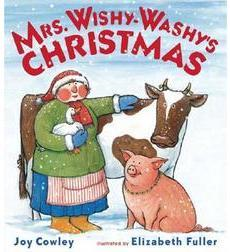 Mrs Wishy Washy’s Christmas is the Christmas addition to the Mrs Wishy Washy book series written by Joy Cowley and illustrated by Elizabeth Fuller. Mrs Wishy Washy lives on a farm, she has pigs and cows and horses and sheep… she also loves to wash, wash, wash! In this story, best suited for children from about two years old, all the animals are due to have their Christmas bath so they are clean for Christmas day. Mrs Wishy Washy gets the bath tub ready outside but the animals have other ideas and sneak inside to the bathroom where they have a wonderful warm bubble bath! For little ones, work on the ‘sh’ sound with the phrase ‘wash, wash, wash’ or spend some time playing with animals toys using their learning to listen sounds again and again which will help your child learn to associate the animal toys with the sounds they make. Talk about parts of the animals such as their tail or hooves, or ears, or snouts as you wash the animal toys, and ask which type of baths the animals preferred – hot or cold? Develop auditory memory and auditory feedback loop by giving your child instructions as to who needs a wash next, ask them to repeat back what they heard as a way to develop their auditory feedback loop, and challenge their listening by asking them to remember just one animal, then two animals then three or more! For older children you can start to make your instructions more challenging by adding words like ‘before’, ‘after’, ‘all except’, ‘don’t…until’, ‘if…then’ in your instructions – sometimes the silliest instructions turn out to be the funniest, so don’t be afraid to play around!